The High Park Nature Centre is a charitable organization that was established in 1999. Our mission is to promote awareness and respect for nature through year-round, hands-on outdoor nature education and park stewardship. Nature Centre programs inspire a sense of wonder, knowledge and respect for High Park’s natural systems; restore human connections to local plants and animals; and engage visitors in ecological restoration activities to ensure a sustainable future for High Park for generations to come. The High Park Nature Centre serves a diverse audience of over 14,000 people annually from across the Greater Toronto Area, including children, adults, seniors, families, elementary and secondary school students and teachers, ESL schools, Girl Guides and Boy Scouts, community centres and recreational programs. 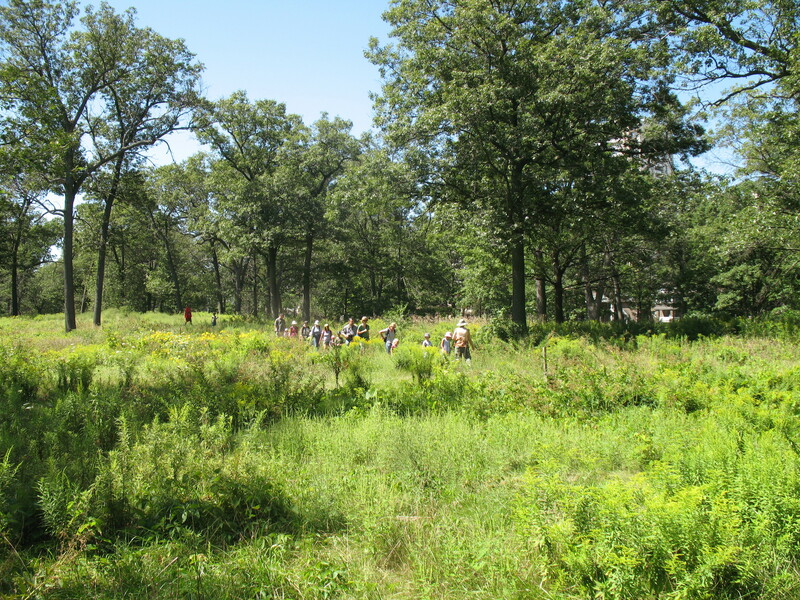 Through the Nature Centre’s programs, over 80,000 participants of all ages have been able to “give back” to High Park through park stewardship activities like planting native grasses, wildflowers and sedges or removing invasive plant species. Centrally located on 399 acres (161 hectares) of land in the heart of the Toronto, High Park provides visitors with a unique and unusual sense of wilderness. The park is home to countless species of wildlife, including insects, birds, amphibians and reptiles, fish and mammals. Recognized as one of the most significant natural sites within the City of Toronto, the park contains an outstanding concentration of rare plant species, including woodland fern-leaf, cup plant, shrubby St.John’s Wort and the wild blue lupine. About one-third of High Park’s terrestrial system is considered to be ecologically significant because of the rare vegetation and wildlife found there. The most famous and admired plant communities in the park are the black oak savannahs; remnants of the sand prairie systems that once covered much of southern Ontario’s landscape. By some estimates, less than one percent of oak savannah ecosystems are left in the world and High Park contains the fourth largest remnant globally. It is easy to think that the natural environment in High Park will always be there for humans to use and enjoy. However, the rapid expansion of the city over the last century has endangered and degraded the park’s natural environment. If we want future generations to be able to experience this incredible natural legacy in the heart of our bustling city, we need to teach people how to protect and restore its natural areas. This unique and fragile environment needs the Nature Centre’s educational programs to engage the heads, hands and hearts of park visitors in stewardship activities that will ensure the future of High Park and position them to practice environmental stewardship in their daily lives. For more information on natural history, other groups operating in the park and park events, please visit the High Park Nature website. The High Park Forest School – Our New Headquarters! High Park Forest School opened on July 15, 1914 with an attendance of 115 students. For the school’s first 18 years in operation, it was housed in three outdoor tents and a set of wooden platforms fitted with desks, benches and blackboards. Students who were malnourished, had mild cardiac conditions or had been in contact with persons with tuberculosis or cholera attended the school to derive health benefits from time in the outdoor environment of High Park. The Forest School program operated from May 1 to October 31. At the beginning of November, students returned to their neighbourhood schools to participate in regular classes. By the early 1930’s, enrollment in the High Park Forest School had grown to 264 students and it was decided that the school should have a permanent building. Constructed in 1932, the Forest School was designed as a pavilion with a large central classroom surrounded on three sides by offices, meeting rooms and a large kitchen. By the early 1960’s, significant improvements in medicine and sanitation resulted in the decreased incidence of tuberculosis and cholera. As a result, the Department of Public Health decided that the Forest School program was no longer needed. The Board of Education closed the doors in 1964 and returned the remaining students to their regular schools. Around 1975, the Ontario Foundation for Visually Impaired Children (OFVIC) moved into the building and provided educational services to blind or low-vision pre-school children. During the summer months, the Forest School also housed summer day camp programs run either by the City of Toronto or the Toronto Board of Education. In 2014, OFVIC found a new home and the Forest School became vacant again. Thanks to our partners, the City of Toronto, and funding from the Ontario Trillium Foundation, the High Park Nature Centre moved from our previous headquarters in the Lawn Bowling Club House on Parkside Drive to the Forest School in June 2015! We couldn’t be more thrilled to become an integral part of the history of this fascinating building. The Forest School building was designed with the belief that spending time outdoors would benefit children’s health and well-being. We are excited to bring the Forest School back to its roots!